So I take my PLC Adapator at the concierge. Plug it in my room and start to surf the web. Performance is good… Now I am looking for another electric plug for my MacBook AC… oh maaaan! I cannot find any other free plug.. except in the bathroom. This is really annoying and stupid… Sorry for this little post about a small and annoying experience.. alone in my PLC bedroom. This week I have attended a SOA conference in Paris the SOA Forum. (I was not there in 2006). This event is not a technical event targeted towards developers but mainly oriented for IT managers and decision makers. This day was well attended, around 200 people. The content and more important the questions and round tables provide a good snapshot of how SOA is adopted. If last year, based on comments that I can get, the message was “What & Why SOA?” this year I have the feeling that most of the audience was really familiarized with the SOA concepts -as I said earlier it is not a technical conference- and now they are more asking “How and When SOA?”. Lot of discussions were about how to I start the projects, since in many case the SOA will impact the whole IT, and even more the full enterprise. 7 reasons I switched back to PHP after 2 years on RailsI am far away of being a PHP expert, or even a Ruby one, but I have the impression that I could post a similar title with Java instead of PHP. If this is true that Java EE could look a little complex for a start -this is probably less true today with the new JavaEE simplifications-. Yes… when you compare Rails and Java alone it is more complex but we should not forget that Java is now more a platform than a simple programming language. And many developers and companies have built very productive solution on this platform. I think this is one of the key point here. Enterprise is using JavaEE a lot and it is part of the IT, moving to another technology will be expensive even if development is faster. In addition, the developers, administrators are used to develop and manage Java based applications. And I do not want to talk about how complex it could be when you are building a Rails application on an existing database, designed from a pure Entity/Relation methodology…. I love this reason, but nothing special to say, I let you read the original post. As you can see from the number of comments in Derek’s blog -no times to read all of them- this entry generates lot of reactions. With all the Web 2.0/Social Networking noise we are all used to “virtually socialize”, but now you can use it to do more and improve the quality of your trips. The site IDTGV and Co (only in French so far) allows you to enter your profile and hobbies. Then when you do a reservation for the TGV (high speed train) you can match it up with other travelers. I have not tried this service yet since I am mainly traveling in the north of France but I will for sure try it as soon as I can…. Let me know if you have tested it. 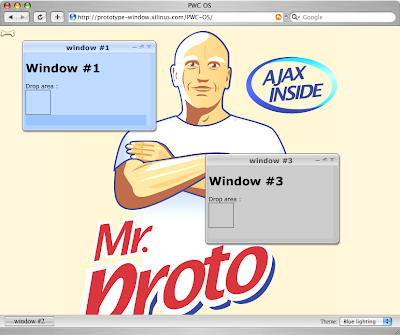 I am sure that most of you already know the “Prototype Windows” project that provides a very powerful way to create windows and dialogs inside your Web pages. If you do not know it, take a look it’s awesome! Sebastien Gruhier, aka Mr Proto, and others have done a terrific job allowing developers to integrate exciting features with few lines of code. Find more on the PWC site or on Mr Proto’s blog. A friend of mine was asking me how to generate a unique ID for his application… As you probably already know Java SE 5 has introduced the java.util.UUID class to easily generate Universally Unique Identifier (UUID). As usual Wikipedia is a great starting point to learn more about UUID. OracleAS OC4J and Java EE Releases…. This morning I was helping a customer to debug some Web Services deployment issues, when I simply realized that the error was coming from the fact that he was trying to deploy a JAX-RPC service on a OracleAS 10gR2 server; where it is not supported/available. This give me the opportunity to clarify the different versions of the Oracle Application Server and their related Java Enterprise Edition release support. I was in Paris last week end so I took this as a good opportunity to visit the city using the new “Velib” system. Velib is a new self service rental bike system that the city of Paris and JCDecaux put in place on July 15th. So you can take and return any of the 10,000+ bikes in any of the 750 locations all around Paris. I believe that Paris wants to a total number of 20,000 bikes for 1,400 locations. From a technical point of view, the rental system is really nice, the bike stations have a nice and simple to use system allowing you to take a bike, see your balance and they are all connected together allowing you to take and return bike anywhere in Paris. I will try to find more information about this application that is probably quite fun, and hopefully not like the www.velib.paris.fr site, the stations are available in multiple languages. I was helping a customer with his BPEL in cluster and we needed to follow the flow and on which machine the instance was running. This code is just an example of what could be done. Here I am using java.net code API and put the result in a BPEL global variable using the setVariableData method. Obviously you will use appropriate code to differenciate the different nodes for example the name of the OC4J instance, hostname, … or any interesting value.